San Martino Di Castrozza : simply stunning! 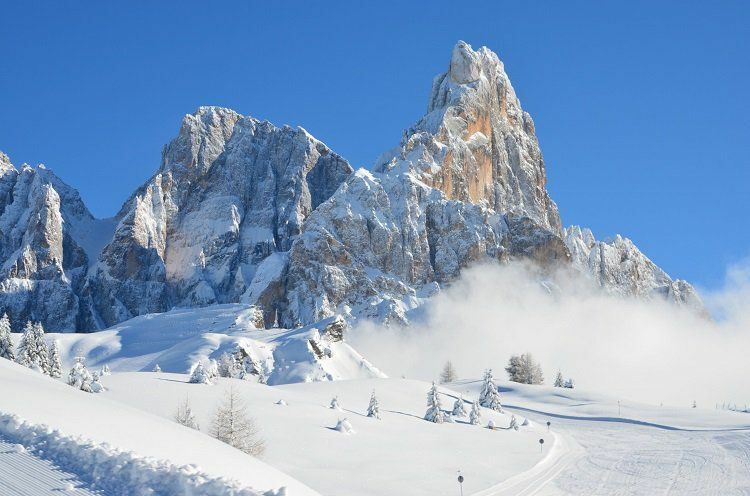 One of Italy's best known ski resorts and a classic in the history of winter sports, San Martino boasts some of the most spectacular scenery in Europe, offering a back drop of forested hills backed by 3000m of pink Dolomitic rock. San Martino lies on a wide highland of pastures surrounded by thick woods, on the southern slopes of the Alps, in the area of the Dolomites that is the easternmost part of Italy's Trentino region. San Martino's area also extends to include the nearby high-altitude lifts of Passo Rolle which begin by the roadside at 1994 metres giving great late season skiing. San Martino is, without a doubt, one of the most beautiful and charming thanks to the impressive panorama It offers. Located in the heart of a UNESCO Natural World Heritage Site the 'Pale di San Martino' is some of the most stunning scenery in the Dolomites. Next there is the classic feel of San Martino. It’s something that’s hard to put in to words but it’s simply a timeless elegance that a few long-established ski areas have but most don’t. San Martino definitely has it, with lots of characterful shops as well as cafes, restaurants and hotels. And of course there’s the skiing within the beautiful 'Paneveggio Pale di San Martino' Nature Park. It’s not a huge area, perhaps why the tour operators stay away in the modern era obsessed with giant, soulless resorts. 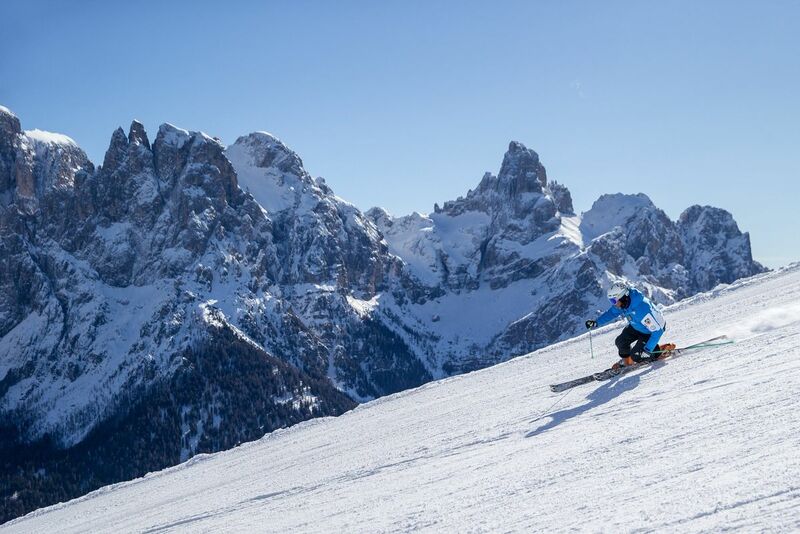 The 60km of slopes in the San Martino di Castrozza ski area include 30km of wonderful, red runs where intermediates will be in heaven! The remaining 30km are equally shared out between beginners and advanced skiers meaning no-one feels left out here. The slopes range from 1.404 to 2.357m in altitude, with the Passo Rolle sector known as one of the most snowsure in Italy. There are three ski areas locally, all of which are included on the Dolomiti Superski Pass, the world's largest lift pass system. Closest to the village, although not the largest , a new six seater gondola runs up to meet the Rosetta cable car base station. The new gondola begins from far closer to the village edge and serves blue and red trails from its top at the Rifugio Col Verde. The spectacular cable car continues up to Rosetta, the resort's highest point at 2609m (8560 feet) although there are no market pistes down through the treacherous chutes at the top. The highest and largest single lift served terrain is at Tognola, a wide sunny hillside above the tree line, accessed primarily by the new gondola from Fratazza, a bus journey out of town. Another option is to take the triple chair from the outskirts of the village beyond the ice rink - runs are cut back down through the forests and are largely covered by snow cannons. The third option is to take the ski bus up and over to Passo Rolle. A traditional 'end of season' mecca because of it's high altitude base, all but one of the six lifts are chairs, and all have snow making. Beginners have gentle meadows at the edge of the village on which to make their first turns. Experts have only a few black trails and will need to head off-piste with a guide or make use of the Dolomiti Superski Pass to explore neighbouring areas if they are to get the most of San Martino. However the steepest run in the resort, down below the new gondola from Tognola extends for over three kilometres with extremely variable and in some stretches really thrilling terrain, and all the while you have fantastic scenery in front of you. A little more technical in some places halfway down, the Paradiso route on Passo Rolle also has to be tried. The Pale di San Martino and the Lagorai range of mountains offer infinite possibilities for ski touring at every level; from the easy off-piste routes to the real and proper trekking in the vast mountainscape with limitless solitude. Because San Martino is at a high altitude for a traditional resort, and because these meadows have snow making, conditions are normally good at village level. Otherwise the choice of gondolas to high altitude areas also with easy runs make San Martino a good choice to get started. Moreover, the variety of the slopes and the different directions in which they face there is no problem in finding fresh, powdery snow throughout the winter. 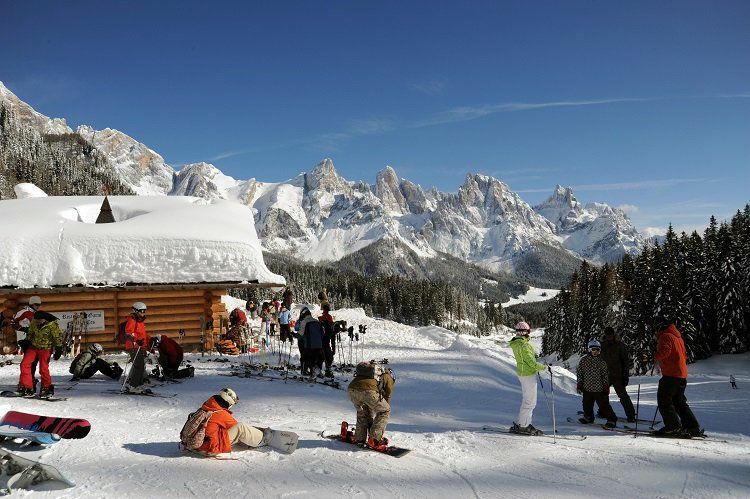 More good news is that San Martino di Castrozza is also one of the ‘greenest’ ski resorts in the world so your hotel stay and days on the slopes all come guilt-free with zero CO2 emissions. The village has been powered by renewable electricity for over a century. In fact it now produces 10 times as much green energy as it needs and is a net exporter to the grid. It has increased its green credential still further in recent years replacing old individual oil-powered heating systems in hotels with a communal biomass green energy system and petrol pumps with charging points for electric cars. In fact in a nice marketing move, San Martino and Passo Rolle have so much hydro-electricity to spare they offer the chance to charge up your electric or hybrid car free of charge, wilt you recharge your own mental and spiritual batteries out in their stunning mountain scenery.